Effect of the technology of flux-free preparation of a magnesium alloy on the efficiency of cleaning molten metal from nonmetallic inclusions is discussed. Dependence of the thickness and composition of the filtration layer on the inoculation effect and refining of molten metal has been revealed. Dependence of nonmetallic inclusions content on the filtration rate has been shown. A process for the preparation of an alloy with a high degree of cleanness from nonmetallic inclusions has been developed. The results of research of influence of duration of an irradiation of a liquid phase by nanoseconds electromagnetic impulses (NEMI) on crystallization parameters, processes of structurization, physical-mechanical and operational properties of copper and tin bronze are brought. At optimum duration of irradiation NEMI of 10 15 minutes appreciably change of crystallization parameters and structural components are reduce to fragments. At that density, heat conductivity (in 1,5 times for copper and 2 times for bronze), heat resistance (on 20% for copper and 27% for bronze) and corrosion resistance (in 2 times for copper) are sharply increase. Corrosion resistance of bronze decreases because of structural components are reduce to fragments. Results of research of influence of duration of an irradiation of liquid phase by NEMI on processes of crystallization, structurization and physical-mechanical properties of the granulated aluminium and silumin (17 % Si and 4 % Cu) are brought. At optimum duration of an irradiation (10 15 minutes) liquid phase by NEMI the maximal value of a degree of condensation and minimal time of crystallization is observed. Heat conductivity of the irradiated sample increases in 1,7 times for aluminium and 1,3 times for silumin, the density of aluminium has the minimal value, and hardness essentially does not change. At that sharply size reduction of silumin structural components is observed. Results of research of influence carbide-forming elements (Cr, W, Mo, V, Mn) on temperatures of the beginning and the end of statistical ordering of low-carbon liquid cast iron at cooling are brought. It is established, that all the investigated alloying elements increase temperatures of the beginning and the end of statistical ordering of melt. Alloying elements with higher density in comparison with iron (W and Mo) condense of melt up to chilling temperature more intensively owing to strengthening interparticle interaction with components of cast iron (Fe and C). All alloying elements reduce factor of thermal compression (shrinkage) statistically ordered liquid phase. The more densely the alloying element, the is to a lesser degree compressed a liquid phase from temperature of cooling. Based on studying the variation of hardness, microstructure and dislocation structure, the mechanism of self-organization of high-speed steel structure during magnetic hardening treatment is described. The proposed scheme of self-organization of structural transformations at magnetic action is also acceptable for other high-alloy steels with ferromagnetic components. A review of publications addressing the problem of improving the production efficiency and radical improvement of quality of metal products, including use of new technology for producing a continuous steel billet on a casting-and-forging module is given. 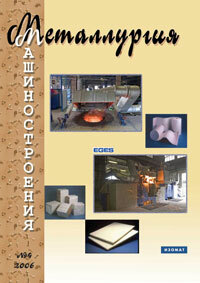 A patented process for producing continuous billets from metal being cast is described. Physical modeling on a model of plastic deformation of a billet in crystallizer has been carried out. Distribution diagrams for the flow of deformed material depending on the degree of its squeeze have been obtained, which will be used to determine strains and forces in cross-sections. The process of formation of continuously cast billets on a casting-and-forging module has been investigated. The main technological factors influencing the process have been revealed. Optimum limits of varying these parameters have been established, and methods for selecting these parameters depending on the type of alloy being cast have been proposed. The methods have been tested in the production of billets from Al-Si and Pb-Sb system alloys, and they have confirmed their availability. Thermal conditions of the crystallizer in a casting-and-forging module have been investigated at its operational preheating with different initial temperature distribution in its three main sections. For these sections, inequalities have been written describing temperature distributions for providing a stable technological process of making billets. Relationship between the diagrams of state of alloys being cast and the main process conditions of making continuous metal products has been established. Examples of determining the duration of operational preheating for Pb-Sb and Al-Si system alloys are given. Methods for controlling the duration of operational preheating of the crystallizer and the most expedient way of controlling the process have been proposed. Results of investigating the effect of gas-laser cutting of titanium sheet blanks in the atmosphere of commercial nitrogen on the cut quality are given. It has been shown that when observing optimal cutting conditions not only a good cut quality is achieved, but also the content of gas inclusions, including nitrogen, in the surface layer of titanium blanks does not exceed the permissible limits. Designs and technical characteristics of hand-operated high-speed pneumatic grinding machines with turbodrive and gas-lubricated bearings are presented. As compared to branch-specific machines for similar applications, the developed tool allows improving performance and increasing life time, and reduce wear of abrasive tool.